Ever eat red flannel hash? A regional delicacy, it's a New England variation on more common hashes, such as corned beef hash. The main difference is that in place of corned beef, you get chopped beets fried into a mesh of potatoes, onions and, if you're doing it right, bacon. The beets do two things. One, they impart a bloody coloration that's often hilariously revolting to unsuspecting non-Yankees. The other thing beets do is bump up the nutritional value of the hash, because beets are really good for you. In that sense, red flannel hash is a more sophisticated, healthier hash, despite its provincial roots. Which brings us to the latest full-length record from Burlington-based punk trio Black Rabbit, Red Flannel Hash. To mercilessly mangle the breakfast food metaphor, Black Rabbit's earlier efforts were like a standard diner omelette: greasy, filling fare that's comforting in its predictability — not to mention ideal for nursing a hangover. The band's 2012 self-titled debut EP, while solid, was a rote recitation of gangly 1970s punk. They spiced things up on the 2014 full-length Lipstick and Dynamite. Emboldened by improved production and stylistic daring, that record was like the eggs Bennie you'd get at a hip brunch joint — say, Sneakers Bistro. It's still essentially gut-busting, punk-rock comfort food, but with better ingredients and more creative flair. Red Flannel Hash goes even a step further. The foundational flavor of the Ramones and New York Dolls is still there but now emerges subtly on the palate amid more complex tastes — a dash of art rock here, a pinch of power pop there. In particular, those bloody beets offer a healthy dose of fresh seasoning in a newfound attention to melody and harmony both instrumental and vocal. To that last point, vocalist and guitarist Marc Scarano has never sounded better. He can still get his disaffected snarl on, as he does on searing opener "Nicky Says," "Double Line" and "Alienation," to name a few cuts. But his performance on the meandering fanboy takedown "BS Passes" is notably tuneful and nuanced. His sharp vocal work matches the pointed, playful writing he displays throughout — such as this line from "The Original Original": "I am the original original / Analog to your digital." Scarano's guitar work is equally fierce. While still necessarily scruffy, his riffs and solos color the record with beefy muscularity. He shreds, proving that there is room in punk for people who can actually play their instruments. Jane Boxall, the band's classically trained drummer, would agree. Her technically immaculate playing is by turns ferocious and refined, adding subtle accents that forge greater depth on each listen. Bassist Darlene Scarano — yep, these Scaranos are married — uses Boxall's bombast as a springboard for her own sneakily nifty low-end lines. Black Rabbit's Red Flannel Hash is a rare punk record that succeeds as much on gnashing attitude as it does with wit, melody and musicality. Eat up. 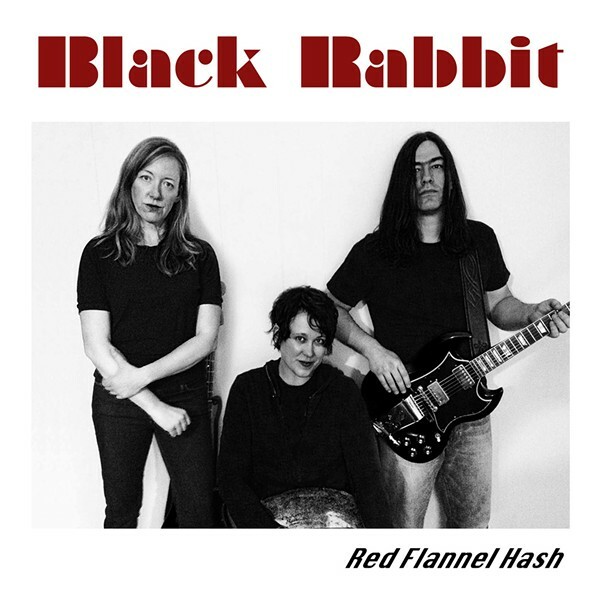 Red Flannel Hash by Black Rabbit is available at blackrabbitvt.bandcamp.com. Red flannel hash is available at mom-and-pop diners around New England. Soundbites: Thoughts on GPN; New Records Galore!